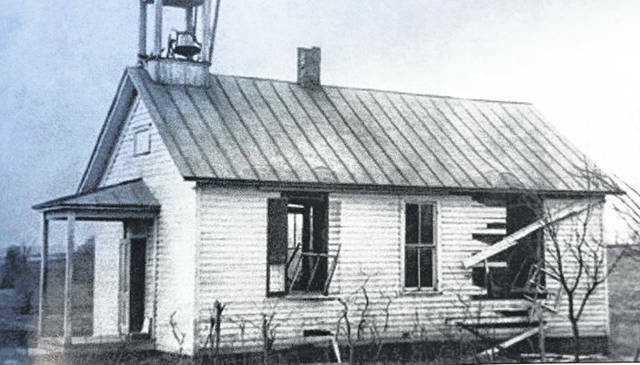 The Carmel School, pictured in this photo from the Meigs County Historical Society, was struck by lightening on March 25, 1913. The recent Meigs County Historical Society newsletter gives an account of the event as written by Inez McNamee Radford, whose brother Ralph was injured. The account goes as follows, “Ralph was sitting by the window and was badly injured with a big gash across the top of his head, a streak down his neck and across this shoulder. His arm had no skin from the shoulder down. His hair was all burned. He had a wool coat on and there wasn’t a mark on it bit the cotton shirt sleeve underneath was in shreds. Dr. Philson said he could not live until morning but he recognized everyone that visited. He had no feeling in his arm what was injured by the other arm pained him. He complained of his left ear hurting but it was his right side that was injured. I (Inez) was outside doing laundry and Ralph came and asked me to look in his ear. I took a hairpin and got a hunk of either wood or metal from his ear. He never complained any more after that. His hair grew back very think. The experience did not seem to be make him nervous about storms after that.” Ralph was about 12 years old at the time. Other accounts of the event can be found in the Meigs County History book and in The Daily Sentinel on the 75th anniversary of the event in 1988.